When you’re on a boat 50 miles south of Cape Cod on a calm day, the water around you may look flat and relatively featureless. A few hundred feet below, however, a cliff-edge hovers over an abyss. That edge, running roughly parallel to the coastline, is called the shelf break. 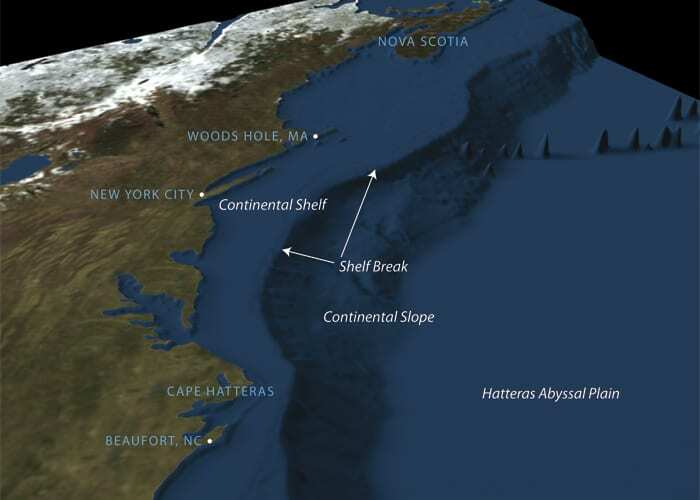 There, the shallow, gently sloping continental shelf gives way to the much steeper continental slope, which plunges thousands of feet to the ocean floor. Look even closer: The water above the shelf break is bustling with life. Satellite images show massive blooms of phytoplankton above the shelf break off the U.S. East Coast. The phytoplankton attract zooplankton, which attract predatory fish and squid, which attract large fish, dolphins, whales, sea birds—and fishermen. One reason for this abundance of life is upwelling, the movement of water from great depths to the surface layer. Upwelling carries nutrients from the depths to shallower, sunlit zones where they provide nourishment for phytoplankton to bloom and set the food chain in motion. 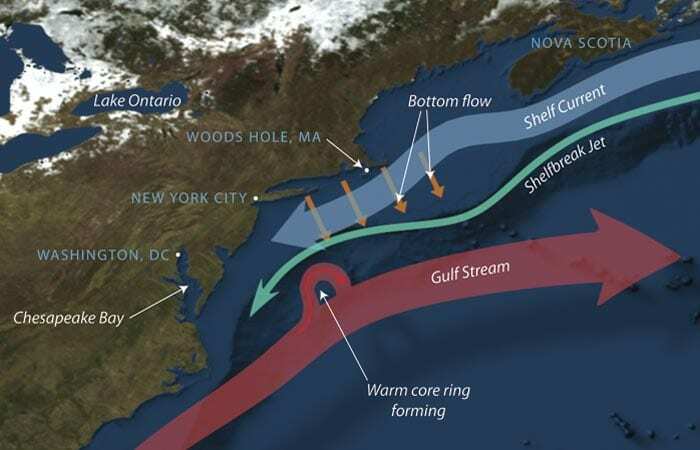 Upwelling and its bonanza of nutrients occur at a few other places in the ocean, caused by conditions and circumstances that scientists largely understand. But what controls this important and fundamental phenomenon at the New England shelf break remains a vexing and complicated mystery. It was just the sort of problem to tantalize Jessica Benthuysen (ben-THOO-zen), a graduate student in the MIT/WHOI Joint Program in Oceanography. On first meeting, Benthuysen comes across as modest and soft-spoken. But behind that exterior lurks an independent thinker who simply will not let go of a tough problem—exactly the kind of person needed to tackle the shelf break. “It’s such a difficult phenomenon to study,” said Glen Gawarkiewicz, a physical oceanographer at Woods Hole Oceanographic Institution, who was on Benthuysen’s Ph.D. advisory committee. The North American shelf break is home to a dizzying jumble of currents and water masses. Relatively cool, fresh waters from the Arctic flow southward along the continental shelf. Farther offshore beyond the continental slope, warm, salty waters of the Gulf Stream sweep northeastward. In between, along the shelf break, a narrow fast current called a jet runs parallel to the coast and opposite to the Gulf Stream. In addition, a flow near the bottom runs perpendicular to the other currents, carrying water away from the coast across the continental slope. The dynamics get even more complicated because water in many of these currents is stratified, or layered, due to density differences (colder and saltier waters are denser and tend to sink). And periodic eddies and whorls of water pinch off the currents and spin away. It’s a whirlwind of water and physics. 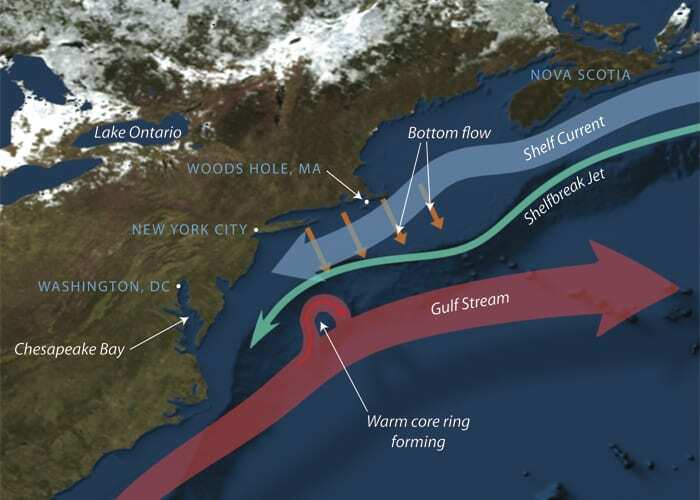 “A lot of the normal theories about ocean circulation that we use for other areas just don’t work at the shelf break,” Gawarkiewicz said. What was needed—and what Benthuysen provided—was new ways of thinking about the problem. That’s quite an accomplishment for a student who didn’t get interested in oceanography until fairly late in her academic career. She ended up majoring in applied mathematics and physics and developed a fascination for fluid dynamics—but still didn’t have an oceanographic context. She didn’t put all the pieces together until she visited MIT, where she had been admitted to a doctoral program. At a dinner for prospective students she met WHOI physical oceanographer Joe Pedlosky, who wrote the book on the subject, literally: Geophysical Fluid Dynamics. She switched to the MIT/WHOI Joint Program and, after completing two years of coursework, decided to do her graduate research with physical oceanographer Leif Thomas. To explore the complex physics going on at the shelf break, Benthuysen created a stripped-down mathematical model of the system. She left out potential contributions from some factors, such as wind. That kept the math manageable, though still challenging. Her model showed that a combination of just four factors—the current flowing along a coast, the slowing of water movement at the ocean bottom due to friction, the presence of stratified water on both sides of the shelf break, and a big change in slope of the seafloor—give rise to upwelling right at the shelf break. Her model can even predict the strength of the upwelling, something no previous model had been able to do. He said her model will be helpful over the next few years when scientists from WHOI and other institutions set up the Pioneer Array, a grid of subsurface moorings with instruments that will span the shelf break and gather data to help oceanographers piece together the complex movements of waters there. Thomas said Benthuysen’s work also has implications for understanding the dynamics of currents far beyond coastal zones, such as the deep western boundary currents that play an important role in regulating climate. While tackling the source of upwelling at the shelf break, Benthuysen had to deal with a “break” of her own. A few years into her studies, Thomas, her adviser, moved to Stanford. “Jessica had the option to come with me, but I think she was very wise in not following me,” said Thomas in a telephone interview. They both knew he would be preoccupied with setting up his new research program, and she would be leaving her classmates from the Joint Program. “I think she would have felt isolated here,” said Thomas. Now Benthuysen has a chance to test her skills on a very different part of the ocean. 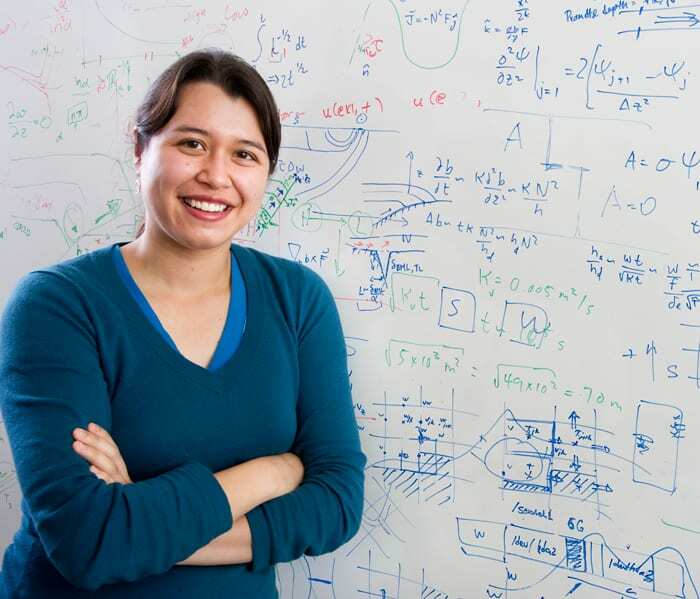 She earned her Ph.D. degree in June 2010, and recently began a three-year postdoctoral position with Australia’s Commonwealth Scientific and Industrial Research Organization and the University of Tasmania, where she will study flow dynamics of the west Australian shelf break. The island state off the southern coast of Australia is about as far from Woods Hole as it’s possible to get. Benthuysen said her family asked her to think hard before agreeing to go so far away for so long. As usual, the prospect of grappling with a tough problem largely on her own didn’t faze her a bit. “I thought about it, and decided, ‘OK, I’m going!’ ” she said. This research was supported by the WHOI Academic Programs Office, the MIT Department of Earth, Atmospheric and Planetary Sciences, and the MIT Presidential Fellowship.